Last week I had the opportunity to visit Community Healthlink (CHL) where I was overwhelmed by the incredible work they are doing. I visited our Adolescent Substance Abuse Recovery unit on Queen Street; Dr. Erik Garcia’s primary care clinic on Chandler Street, which primarily serves homeless patients; and three adult addiction recovery units on Jaques Avenue, were we work with patients as they progress from acute detox to long-term recovery. I also visited with the team from HOAP which helps patients with addiction and other behavioral health issues receive housing and services they need from CHL and other community agencies. The best part of the visit was spending time with a patient who is a recovering heroin addict. In my discussion with him he made it clear that without the help of CHL he would have been dead years ago. “Every day I get up and fight my demons, and if not for the people here, I would have lost the battle long ago,” he told me. 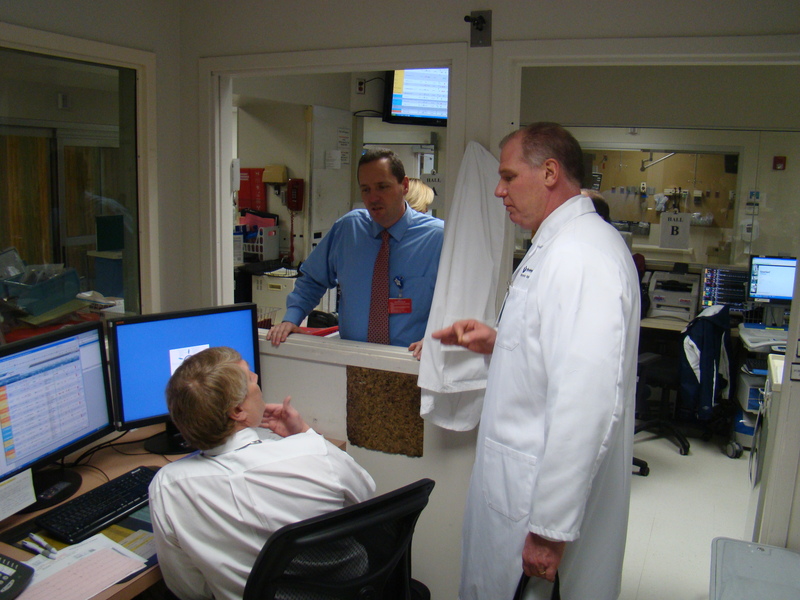 Two weeks ago I had the chance to visit the caregivers at Marlborough Hospital. During the visit I passed out healthy snacks as part of our “myHealth Matters” wellness initiative and learned about the great ideas being registered in the idea system. I also heard about a problem with the new emergency department (ED) electronic health record, ED PulseCheck. Specifically, there is some information that has to be entered twice because of the interface between Sorian and ED PulseCheck. Our hospitalists and primary care doctors have been pushing to get the ED off a paper record for years so they can access critical information from ED visits and soon they will be able to do so, unfortunately, this has temporarily created some extra work for the ED caregivers. To everyone affected by this please know I am working with our IT team to get the “double entry” issue fixed as soon as possible. Please send me a note if you would like us to visit your work area and thanks for everything you do to take great care of our patients and one another. This entry was posted in Employees and tagged Marlborough Hospital, myHealth Matters, Soarian by Eric Dickson, MD, MHCM. Bookmark the permalink.